This is a quiet but very colorful festival that normally takes place in the evening on 12th November, with beautiful hand-made decorated Loy Krathongs sold, which you place in to a local lake or reservoir. Lots of Thai's will place some coins on these creations and sail them out to the spirits in the water, as a way of wishing for some good luck. Large lanterns are also lit up and sent in to the sky to drift away in the night sky. This tradition is repeated on the very minute of the New Year (31 December, not the Thai New Year). Thailand's two main festivals revolve the most essential commodity on our planet - Water! Songkran in April is by far the biggest of the two but Loy Krathongs is very well celebrated and supported. Water is so important to Thailand, and especially the Udon Thani and Issan region, as rice growing is a vital part of life. You will find Loy Kratong celebrated in every village where there is water to place their 'gifts to the spirits'. In Udon Thani, the three biggest locations are the three reservoirs at Nong Sim Park, Nong Prajak Park, and Nong Bua Park. The festival comes in to focus in the evening, after the sun has set, adjacent to the large lakes and reservoirs in Udon Thani. 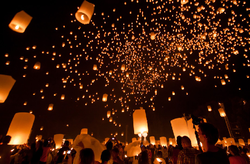 Surrounded by people with their kratongs for sale to all those attending, and thanks to the lovely floating creations, Loy Kratong is the most striking, romantic, exotic, and picturesque of the Thai festivals. 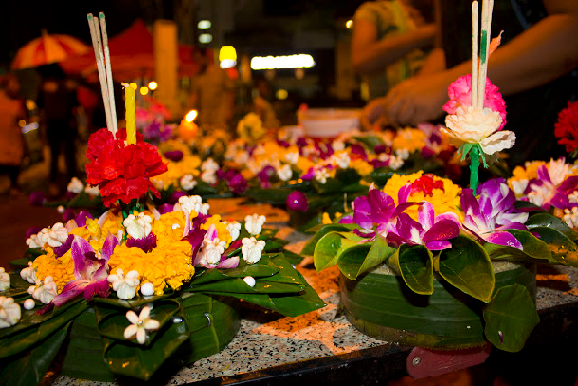 'Loy' means 'to float' in Thailand a “'kratong' is the typically lotus-shaped base upon which candles, flowers, joss sticks, coins, and sometimes food are placed, and put on to the waters surface to slowly drift away. No one is quite sure of the exact origins of Thailand Loy Kratong Festival, though many believe that it is of Indian origin and based on the 'Deepavalee' ritual, something similarly accompanied by floating lights in an act of worship to the Brahmin gods Brahma, Vishnu and Siva, or an act of remission or absolution to the Indian Ganga or Ganges. If true, it would not come as a surprise as Thai Buddhism is actually somewhat of an amalgamation of several different religions, with the Hindu influence playing a significant part. 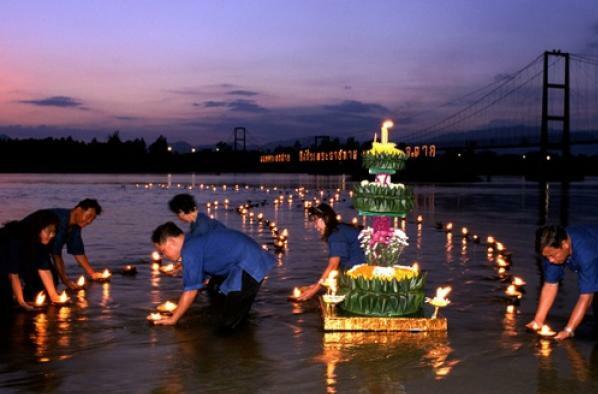 The Loy Krathong tradition, as of today, has most likely evolved from the royal rituals of the early Rattanakosin period in which several types of lanterns were set afloat in the Chao Phaya River and its waterways, and the practice was subsequently adopted and adapted by Thais throughout the country. 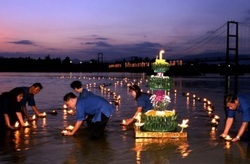 Given the riverine culture that formed the foundation of the traditional life in Thailand, Loy Krathong festival evolved into a ritual in which offerings are made to Mae Khongkha - the Mother of Waters, which is the Thai equivalent of the Hindu goddess of water, as an expression of gratitude for providing life-sustaining water throughout the year. It's further believed that the offering is made in an act of appeasement to beg her forgiveness for the thoughtlessness and carelessness of all those who pollute the pristine water that nourishes all life. As some believe that when launching their kratong, which is a symbolic casting away life’s grief, ill-fortunes, and misery, there are accounts of some placing tufts of hair or clipped finger-nails into the krathong in the hope of ridding themselves of a spell of bad luck or misfortune. Coins are also often placed in the krathong as offerings, but it is not unknown for the kids in the water who are 'managing' the festival, to take the opportunity to take some reward for their efforts.